The Academy will be closed today (11/23/2017) in observance of the Thanksgiving holiday. The Academy will be closed for winter break beginning on Monday December 25, 2017 until Tuesday January 2, 2018. Join us for a special outdoor performance from our Summer Ensembles! 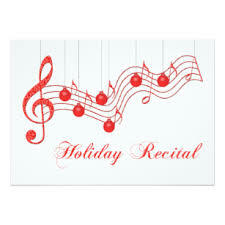 Join us for our annual Holiday Recital to be held at New Heights Chapel. Performances will be at 1:00pm, 2:30pm and 4:00pm.